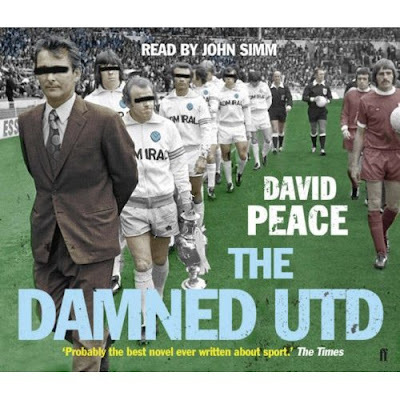 There was a comment the other day on an old post I'd made about David Peace's excellent novel The Damned Utd asking me if I'd like a free audio cd of the book, as read by John Simm. But suddenly the paranoia takes hold. Is it really from Faber & Faber like the poster said? Or is it just a ploy to commit identity theft, siphon all the money out of my bank account (good luck with that, should be able to buy you a bus ticket to York and a sandwich for your journey), apply for countless loans in my name and set up an international money and drug smuggling operation supposedly based out of my front room? There's just no trust anymore, no belief that someone might just want to give you something for free. But just to prove that there is such a thing as a free lunch, the lady in question (Hi Gemma, thanks very much!) got in touch following my tentative (but no address included) reply. The cd popped through the door today. So far I've listened to about an hour of the thing - intense just doesn't cover it really. No doubt, I'll review it sometime in the next week.